Making its North American premiere next week at Tribeca, director Chris Kenneally's digital-cinema study Side By Side has quite a bit going for it: There's co-producer Keanu Reeves, narrating and leading interviews with an extraordinary range of filmmakers including Christopher Nolan, George Lucas, James Cameron, Martin Scorsese, David Fincher, Steven Soderbergh, Lars von Trier and numerous others. There's great technical insight from Oscar-winning cinematographers like Vittorio Storaro, Wally Pfister, Anthony Dod Mantle and Dion Beebe. There's scene-stealers like Joel Schumacher and shooter Geoff Boyle, who encapsulates the digital age with his trenchant summary, "We're fucked." But among all the experts, insights and disclosures herein, there's one appearance in particular that makes Side by Side worth a look: The Wachowskis. While they've made seemingly random news posing for photos with Arianna Huffington and others, I can't even find the last instance of a bona fide interview with Andy and Lana Wachowski. Roger Ebert talked to them a bit in 2008, but for a real chat about their work or style, you'd probably have to go back to their Matrix days, when Lana was still Larry and they hadn't yet settled completely behind their cloak of personal, professional and creative privacy. But there they are onscreen, filling Reeves and Kenneally in regarding the advancement of digital filmmaking and its influence on the Matrix and Speed Racer. And that's not all. "The delivery system of cinema is going to change, and that's almost kind of more exciting in a way for me, beside the actual cameras," Lana says. "This very ancient system of putting a can of film on a truck, driving it to a city, unloading it — that's being replaced." And as for the social-media influence on filmgoing, Andy weighs in with his support: "In some way, the virtual experience is more rewarding, because there's an actual dialogue going on." There's more, which you can see either at Tribeca (where Side by Side premieres Apr. 24) or when the film arrives in theaters and on VOD this August. All of which leads to the question: How did Kenneally and Reeves even get the two to agree to a sit-down with them? We are very fortunate and grateful for all the amazing people who shared their time, insights and knowledge with us for our documentary Side by Side. We were especially fortunate to have been able to interview the Wachowskis since they rarely do interviews. Andy and Lana have had a very successful and close relationship with Keanu, and I believe the reason they agreed to the interview was because of this friendship. The Wachowskis continue to create groundbreaking movies and they are truly pioneers in the use of digital technology. The images they were able to create in the Matrix Trilogy and on Speed Racer pushed the limits of filmmaking art and technology. There are beautiful shots in those films that had never been conceived of before. The Wachowskis were very busy working on their next film Cloud Atlas, which they are directing along with Tom Tykwer, in Berlin, Germany, but they found a few free hours for us one afternoon. Keanu, our producer Justin Szlasa and I flew to Berlin, set up our cameras quickly and got an amazing, insightful and at times hilarious interview. 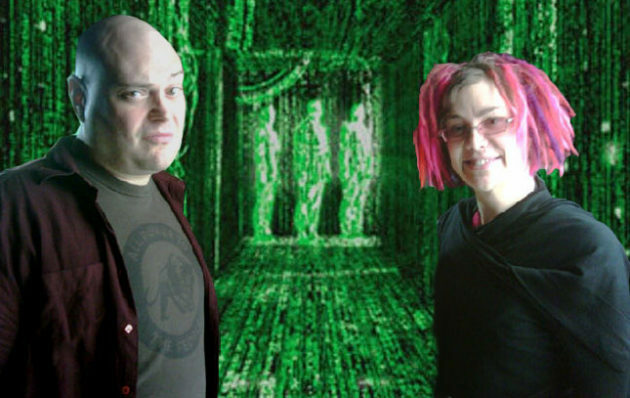 The Wachowskis had a unique, intelligent perspective on image creation, digital technology, editing, archival and couldn’t have been nicer or more welcoming to us. One of the highlights of the Side by Side journey for me was seeing Lana and Andy in the audience at our screening at the Berlin Film Festival. I had the chance to speak to them afterword. They were really happy for us and had a lot of kind words to say about Side by Side. Fantastic. Of course there are plenty of other interviewees and perspectives to catch in Side by Side; learn more about the film and check out a few clips at its Tribeca Film Festival page. I wish the damn Wachowskis would come out of hiding a little more and have an honest conversation about the Larry-to-Lana transformation.The cagey way they've dealt with it kind of screams that they're embarrassed about it, which isn't really a good message to be putting out there, especially for others in her situation, whatever exactly that situation is. Crossdresser? Transgender? Transsexual? It's great that she goes out in public - and on this doc - like that, but with so few role models out there for this part of the community, it would be nice to hear her story. Great guy; Andy.. I was lucky to meet him...he handled 20 questions at once from Matrix fans calmly and was a real cool guy..fun and serious. Good Luck to his sister..health and happiness.